Alas, the time has come to say, “Farewell” to our dear friends here in México and set sail for the South Pacific. Our boat projects are complete. Provisioning is done. Food for the crossing is prepared, farewell dinners and parties complete, ZARPE in hand and the weather window we’ve been waiting for has finally arrived. It’s hard to believe we’ve been preparing for this for close to two years now. Well, actually Dan has been preparing for it for many years but together we’ve been planning this for about two years. Where oh where did the time go? Together we’ve spent countless hours talking, planning, reading, working and preparing for this awesome adventure. We’re both so excited the time has finally come to weigh anchor, hoist the sails and let the winds carry us to exotic locales in the South Pacific and points beyond. We’ve talked with many people who have made this journey and one thing we are looking forward to is that first sight of land on the other side of the ocean. They say you can start to smell the land when you are a day or two out and the moment you get your first glimpse of the lush green foliage and the crystal clear bay at Hiva Oa it is simply awe inspiring! Our friends, Ray and Chicgaila on SV Seanote said it was such an awesome and emotional experience that it brought tears to their eyes and they could hardly speak. Oh how exciting it is to be part of the elite few who make this journey. Rest assured we will be posting lots of pictures along our journey. From here we travel southwest a little over 300 miles toward the Socorros which will be the last place we will see land until we reach Hiva Oa in the Marquesas. It should take two to three days to reach the Socorros and from there we will determine what course we will head to take the best advantage of the winds. The big thing is to make sure we cross the ITCZ (Inter Tropical Convergence Zone) at the best position. The ITCZ is an area of low pressure encircling the Earth near the equator. This is where the trade winds of the Northern and Southern Hemispheres meet. Here you will find areas of convection that often generate vigorous thunderstorms over large areas. You may also find the issue of no wind…the doldrums! Ideally you want to cross in the area where the ITCZ is at its narrowest point. Of course it changes all the time so finding that spot can be tricky. I’m not too worried as Captain Dan is pretty skilled at reading weather and knowing what’s what out there and where we should go. Yes, it’s a vast ocean but all of the registered Pacific Puddle Jump participants communicate daily via SSB video nets. The one for the Banderas Bay jumpers, of which Captain Dan is the Net Manager, meets daily at 0100 Zulu on 8294.0 USB. This is the primary frequency. The alternate frequencies are 8297.0 USB and 6224.0 USB. Each of us will check in and give our location, sea state, weather conditions and crew information. The net is designed to provide us with an additional safety net for as we will know who is where and if help is needed, who is closest. Those boats, like Dazzler, that have a licensed HAM radio operator aboard will also likely check into the Pacific Seafarers Net. They have high powered, land based radio equipment that reaches all the way to New Zealand. Once you check in with them they track you until you reach your intended destination. And, they upload your information on their website so family and friends can track you as well. You can’t have too much communication when you are out at sea! Nightide is the sailboat on the right. Our departure time today is 1100 local time, 1700 Zulu. We expect the journey to take anywhere from 21-28 days. For those concerned about our safety, know that in addition to all the safety equipment and communication we have on board Dazzler, there are over 160 boats leaving the Americas heading to French Polynesia within the next few weeks. This means there are lots of boats out there heading the same direction. Some have already left and at least one that we know of, SV SuAn, has already arrived in Hiva Oa. 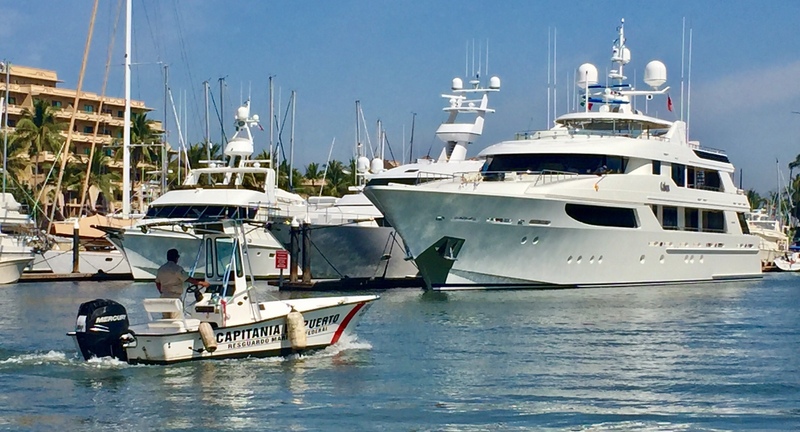 Yesterday two boats left here in Punta de Mita and today as we are departing, our friends, Helen and Ian on Nightide are also departing. The excitement level is high and we are all hopeful for a wonderful passage. To say the least we are excited about the adventure that lies ahead of us and we look forward to sharing it with you, our friends and followers. As we’ve said before we will be posting a daily update of the crossing and hope you’ll follow along. You can go to the bottom of the page and sign up to follow us. You’ll get an email each time we post an update. As we leave the bay here at Punta de Mita, I will scatter some of Daddy’s ashes as we have done in important places along the way. I know he will be watching over us and making certain we have a safe passage. And make sure she stays afloat. And a tranquil sea prevail. When in port and under sail. Today we took Dazzler down to Nuevo Vallarta to the Port Captain. Upon arrival the Port Captain instructed us where to dock and we waited about fifteen or twenty minutes for the authorities to come to the boat. Three uniformed officials greeted us and boarded Dazzler. Two were from immigration and the other was the Port Captain. They were all very nice. One of the immigration officers spoke perfect English which made it very easy. Upon boarding they advised us that once the process was complete we could no longer step on land. Then they requested our passports and visas. All three began filling out paperwork. Dan had to sign several documents and then we waited for the customs agent which took another fifteen minutes or so. He arrived, inspected the boat inside and out to make certain we were not smuggling anything. That took all of five minutes and then they got off the boat, handed Dan the ZARPE and we left. The entire process took less than an hour. So, what exactly is a ZARPE? It is the official exit clearance form you receive from customs and immigration that says you are clear to leave the country. When you arrive in other countries you must have a ZARPE from your previous port. According to some of the reading we have done there are countries that are very serious about this. Not properly checking out of your previous port could result in a very difficult entry into their country. Fortunately Dan is a rule follower and we completed our checkout to the letter. The fee for our boat was $288 pesos and they ask that you pay with a credit card. It makes the entire process much, much easier. As expected, our clearance went without a hitch. It was far more simple than others have claimed but maybe that’s because we followed their instructions to the letter. Everyone was friendly and they even allowed me to get a picture of them although they are not allowed to actually pose. 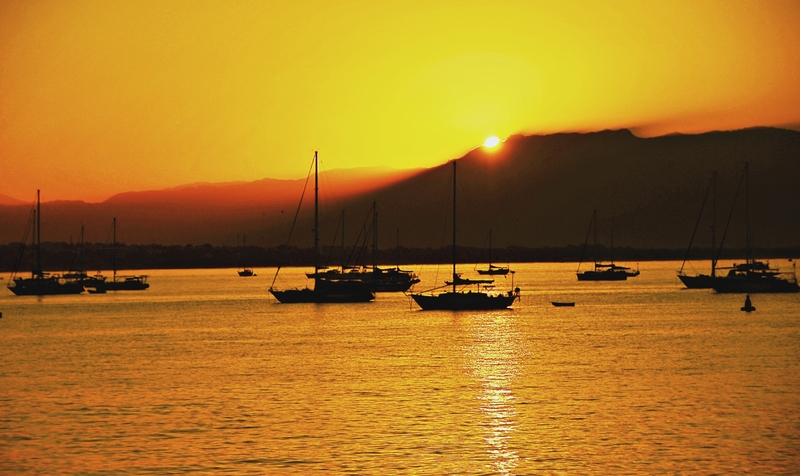 Now we are headed north to Punta de Mita where we will anchor out and enjoy some well needed down time for a couple of days. We plan to make the jump on Sunday, March 25th. Each day we will be posting updates including a photo, our location, distance from Puerto Vallarta, distance left to the Marquesas, weather conditions, sea state, mood of the crew and a few lines about what we’ve encountered in the most recent 24 hours. We want you to be a part of each and every moment and hope you will follow along. Make sure you go to the bottom of this page and sign up to follow our blog. That way you’ll get an email each time we make a new post and you won’t miss a single moment.